$74.99 & FREE Shipping on orders over $59. This Sauvignon Blanc wine kit from Vinter's Reserve is almost as easy to make as it is to enjoy! Our wine concentrate kits from Vintner's Reserve offer excellent quality flavors and aromas, and are a great way to get into the hobby of home winemaking. 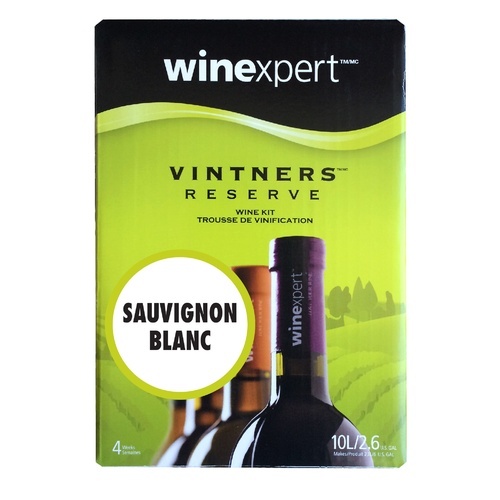 This Sauvignon Blanc concentrate kit includes 2.5 Gallons of concentrate and yields approximately 6 Gallons of finished wine. It is nomrally ready to bottle in about 4 weeks, depending on the fermentation and length of aging. The flavor is full and dry, with a fruity, herbaceous character, which finishes crisp and clean. A versatile wine which handles a wide range of herbs, spices and flavorings. Tried it before and love it. Great product, fun to play around with and try out different strains with a kit a a great price. First one came damaged, but once i told customer service about it they already had another one on its way. Great place to shop. Made some pretty good wine with this! I love this wine kit! I made this with BA11 yeast and added in pineapple juice with it and made an almost 14% abv wine. Everyone loved the wine i made and it disappeared quick! I ordered this again to replicate that batch i did. Winexpert is a good kit to get, no matter what flavor. I would highly recommend this product! I always purchase my own yeast and don't use what comes in the box. Use the MoreWineMaking wine and yeast pairing guide to pick a yeast you think will taste interesting and go for it. The resulting wines are nothing special, but better than most under $10 SBs. NOTE: if you want the grassy, clear SBs like you get from New Zealand, you will not get it from this kit. This is more classic, French SB. Nice & crisp with hints of apricot and grass that borders dry to semi-dry. Everything one should expect in a Cabernet Sauvignon and for a great price. This was my first ever wine kit and it convinced me that I can make good wine at home. It had terrific instructions and was very easy to make. The wine was as good or better than many of the Sauvignon Blancs we buy, a little on the fruitier end of the genre so closer to the NZ as opposed to the French style. I am a home brewer, so I decided to keg half and bottle half. I have not invested in a nitrogen system so over time the keg wine got slightly carbonated just enough to put a little sparkle on your tongue. My wife preferred it to the still and we may try to carbonate it further to go to a sparkling wine next time. So, in short, do not be scared away by the lower price. If you like Sauv Blanc, you will like this kit. OK kit for the price. This is not an expensive kit from concentrate and made a nice wine. I think next time I will not use the yeast that comes with it, as it did seem to strip much more of the flavor I was hopping to have in it.